MS Helgoland is expected to be the first LNG-fuelled ship in Germany. Image courtesy of Fassmer. MS Helgoland ferry is being constructed under the supervision of DNV GL. The ferry's deck plans and facilities were announced in September 2014. Image courtesy of Reederei Cassen Eils. The vessel's keel was laid in July 2014. Image courtesy of Reederei Cassen Eils. MS Helgoland is being constructed by Fassmer. Image courtesy of Reederei Cassen Eils. The EU is providing €4.17m (approximately $4.44m) for the German LNG ferry project under its EU TEN-T programme. Image courtesy of Reederei Cassen Eils. MS Helgoland is a new ferry being built by Fassmer for Reederei Cassen Eils, a subsidiary of AG ‘EMS’. It will be the first German flagged marine vessel to operate with liquefied natural gas (LNG) as its primary fuel. MS Helgoland is scheduled to be delivered in April 2015 and is expected to start commercial operations in June 2015, sailing between the ports of Cuxhaven and Helgoland. The construction cost of the LNG-fuelled ferry is estimated to reach €30m (approximately $31.9m). The EU is providing €4.17m (approximately $4.44m) for the project under its EU TEN-T programme. "MS Helgoland is scheduled to be delivered in April 2015 and is expected to start commercial operations in June 2015." The vessel will be classed with GL + 100 A E RSA (50) Passenger Ship EU + MC E AUT GF notations by DNV GL. It meets the German Blue Angel (Der Blaue Engel) standards for eco-friendly ship design and will comply with the EU’s new IMO regulations regarding sulphur oxide (SOx) and nitrogen oxide (NOx) emissions in the North Sea’s Emissions Control Area (ECA), which came into effect in January 2015. The design and construction contract for the ferry was awarded to Fassmer in October 2013, the ferry’s keel was laid in July 2014 at the Hullkon Shipyard in Szczecin, Poland, and its hull was transferred to the Fassmer Shipyard in Berne for outfitting in December 2014. The hull and superstructure of the vessel are built using steel while its wheelhouse is being assembled using marine aluminium. MS Helgoland will have an overall length of 83m, width of 12.60m, draught of 3.60m and displacement of 1,820t. 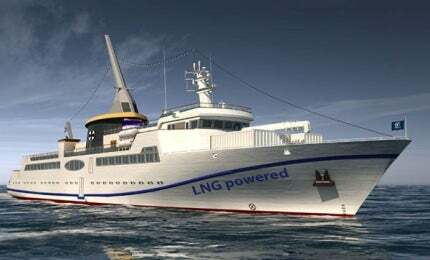 It will be equipped with tanks for storing 25.5m³ of fresh water, 53m³ of LNG and 13.7m³ of marine gas oil, which will serves as secondary fuel for the ferry. It will be capable of carrying 12 crew members, 1,060 passengers, transport cargo and containers measuring up to 10ft, and will be equipped with a 10t capacity crane. The ferry will feature eight lounge areas, a children’s playground and a three-deck light-filled atrium with a glass elevator connecting all the five decks. Deck 1 will house the vessel’s machinery, Deck 2 will offer a lobster shack, a bistro, a spacious living room and a smaller area for guests, Deck 3 will feature a common restaurant, a gourmet restaurant, and a bar, and Deck 4 will offer a spacious open sun deck featuring a gastronomic outpost. Deck 5 will feature a sun deck and a Skybar named Süllberg. The vessel’s propulsion system will comprise two Wärtsila nine-cylinder 20DF (dual fuel) main engines with an output of 1,665kW each, two Wärtsilä gearboxes with 700kW power take-off (PTO) / power take-in (PTI) shaft generators, and two Wärtsilä controlled pitch propellers of 2,600mm diameter each. US shipping firm TOTE contracted General Dynamics NASSCO shipyard for the design and construction of two 3,100TEU advanced Marlin-class container-ships in 2012. It will further be equipped with an auxiliary MAN E3262 LE202 natural gas engine rated at 500kW. The propulsion system and the hull design will enable the ferry to sail at a cruising speed of 20kt. The fin stabiliser aboard will ensure passenger comfort. Wärtsilä will supply its proprietary LNGPac fuel bunkering and supply system with associated safety and automation systems, and its proprietary Cold Recovery system for the vessel’s air conditioning systems. The contract for the supply of the automation, switchgears, motor starters, distribution panels and lighting equipment, including the complete cable network, navigation and communication equipment for the ferry was awarded to Imtech Marine in January 2014. Bomin Linde LNG has reached an agreement with the vessel’s operator in December 2014 to supply natural gas for the vessel. It has further decided to install a LNG storage facility at Hamburg, Germany, for this purpose.